The controversial redux of Fritz Lang's's 1927 sci-fi masterpiece is getting a Blu-ray release in November. 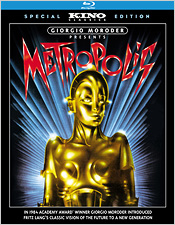 Kino Video has just announced 'Giorgio Moroder Presents Metropolis' for Blu-ray on November 15. The Blu-ray will feature a new high-definition digital scan of the Moroder cut with the original 2.0 audio as well as a 5.1 mix and supplements will include: Introduction from Moroder, The Fading Image (documentary on this version's restoration), photo gallery, and theatrical trailer. You can find the latest specs for 'Giorgio Moroder Presents Metropolis' linked from our Blu-ray Release Schedule, where it's indexed under November 15.